Dundee United teenager Mark Wilson has signed a new three-year deal with the club. The versatile 18-year-old, who was voted SPL Young Player of the Month in November, can play in midfield or defence. Wilson is currently sidelined with a knee injury and is set to undergo a minor operation, which will see him miss out for a month. 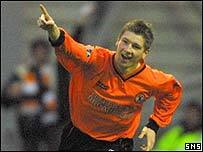 "Players like Mark are the future of the club and I am delighted that we have sealed the deal to keep him right until the end of season 2006," said United manager Ian McCall. Wilson has made 25 appearances for United this season and bagged his first goal for the club in the 1-1 draw with Hibs in December. Meanwhile, McCall has been busy eyeing up potential signing targets for next season. Young Everton midfielder Kevin McLeod and Trinidad striker Nigel Pierre have been training with the club. And McCall has been linked with several First Division players, including names from his former club Falkirk, Clyde skipper Jack Ross and Inverness Caley Thistle midfielder Barry Robson. "I don't want to be putting a lot of people out of the door int he summer," said McCall. "But clearly some will move on and others will come in. "I am looking at who might be on the list of new arrivals and there are a lot of possibilities at this stage."